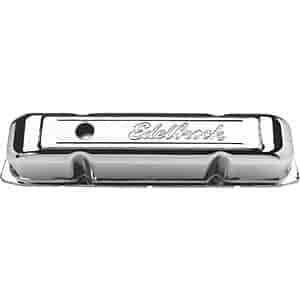 The Edelbrock Signature Valve Covers are available for most popular applications in two show stopping finishes; brilliant triple chrome plated with a stamped logo or a modern stealthy textured black with a screen printed logo. Low profile covers are stock height and tall profile are about 1-1/2" taller than stock. Tall valve covers will clear most aluminum rockers with moderate lift cams but will not clear stud girdles. Most include OE-style breather baffles, except where noted - (no baffle), to prevent excessive oil usage through the pcv valve. They feature provisions for all emissions equipment, with rubber grommets for the pcv and breather holes included. Does Edelbrock 4491 fit your vehicle? 4491 is rated 1.0 out of 5 by 1. Rated 1 out of 5 by Ajess498 from Does not fit These covers look good and I couldn't wait to put them on, but every bolt holes is off by at least a half a bolt on my factory heads. You would have to drill out the holes to install and then you are taking your chances with leaks. Edelbrock 4401 - 2-Piece Wing Bolts with T-Top, Length of 4-1/4"
Edelbrock 4402 - 1-Piece Wing Bolts with T-Top, Length of 5"
Edelbrock 4400 - 2-Piece Wing Bolts with T-Top, Length of 3-3/4"